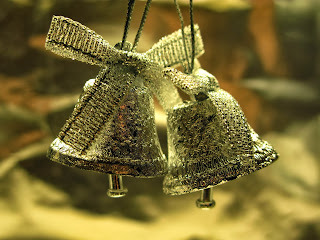 The Christmas song "Carol of the Bells", with its haunting four notes and almost ethereal arrangement, is one of the most popular songs sung during the holidays. The song was composed by Mykola Leontovych with lyrics by Peter J. Wilhousky in 1936. Anthony Potoczniak, a Rice University anthropology graduate traced the origin of the song and found that the original musical composition was based on the Ukraninan folk song "Shchedryk" (meaning bountiful) that was written in 1916 by Ukrainian composer Mykola Leontovich. The song was sung on the eve of the New Year of the Julian Calendar - January 13. It was usually sung by young girls going house to house in celebration of the new year. As the girls sang the tune predicting good fortune, they were rewarded with baked goods or other treats. As part of a mandate by the Ukranian government to promote Ukranian music, Shchedryk was first performed in the United States on October 05, 1921 in Carnegie Hall, 15 years before "Carol of the Bells". When Peter Wilhousky heard Shchedryk, it reminded him of bells; so he wrote new lyrics to convey that imagery for his choir. He copyrighted the new lyrics in 1936 and also published the song, despite the fact that the work was published almost two decades earlier in Soviet Ukraine. In the late 1930s, several choirs that Wilhousky directed began performing his Anglicized arrangement during the Christmas holiday season. The song, now called "Carol of the Bells," has become associated with Christmas because of its new lyrics, which include references to silver bells, caroling and especially the line "merry, merry, merry, merry Christmas." American recordings of "Carol of the Bells" began to surface in the 1940s by such notable groups as Fred Warring and his Pennsylvanians, the Roger Wagner Chorale and Phil Spitalny's "Hour of Charm All-Girl Orchestra."